Plastic disposable plates are a perfect choice for any catered event, including office parties, banquets, and high-end weddings. 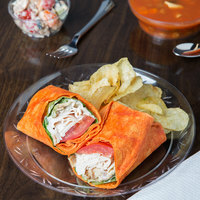 These products come in a variety of colors, shapes, and styles, and offer the convenience of plastic with the classic look of standard dishware. 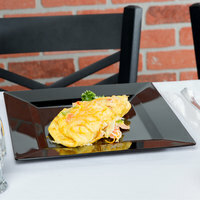 Plastic disposable plates also make for quick cleanup during and after a busy dinner service, as guests or bussers can simply throw them away. These items will not shatter or break when dropped, making them safe for use in a variety of environments. 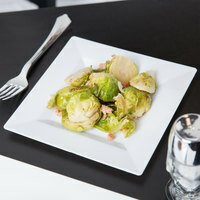 All of our plastic plates are also recyclable and BPA-free. Regardless of the type of business you own or the event you're catering, plastic disposable plates are an excellent choice. To learn more about the differences between these products, explore the tabs above and the filters on the left side of the page. 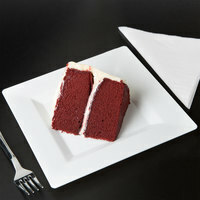 Serve your food on these elegant plates that feature decorative edges. 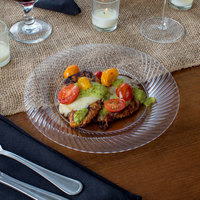 Dinner plates are the largest type, making them ideal for serving entrees. 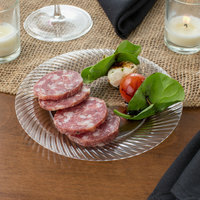 These round plates have a classic shape that is perfect for any dish. 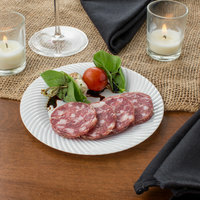 Classic white plates are ideal for weddings and upscale events. 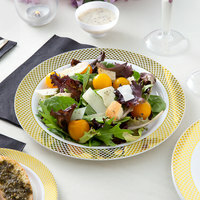 Serve a variety of appetizers, salads, entrees, or desserts on these plates. Create an elegant table setting by choosing our upscale gold plates. Black plates have sleek designs that perfectly complement elegant settings. Silver plates have a sleek and sophisticated look. 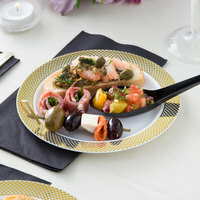 Appetizer plates are approximately 6 inches in diameter, and they're perfect for serving hors d'oeuvres and small dishes. 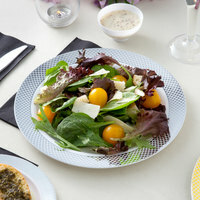 Roughly 7 inches in diameter, salad plates are smaller than dinner plates, and they're perfect for serving salads. Between 9 and 10 inches, dinner plates are the largest options, so they can accommodate your main entrees. 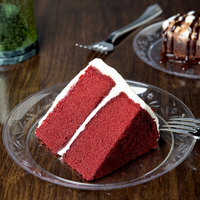 These dessert plates are roughly 6 inches in diameter, and you can use them to serve cakes, pies, cupcakes, and other treats. Lids keep your food fresh until it's ready to serve, and they come in many different sizes and shapes. 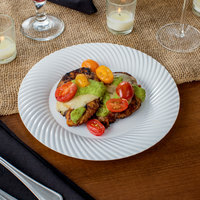 Oval plates provide ample space for a full meal or appetizers. 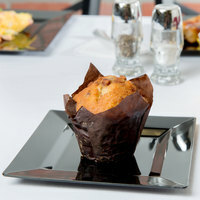 Rectangular plates add a modern look to your dinner service. Round plates are used to serve appetizers, entrees, and desserts. 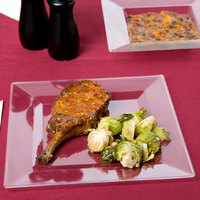 Square plates are an upscale option for high-end events. Plates with compartments are great for serving multiple types of food. 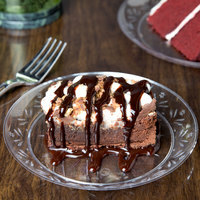 These plates feature a classic look, and you can use them to serve any type of food. Standard plates are perfect for everyday medium-duty usage. 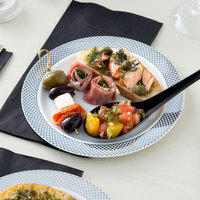 These plates allow guests to hold their glass and plate in one hand. 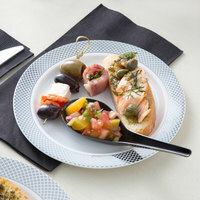 Plates with finger grips are ideal for serving appetizers and hors d'oeuvres. 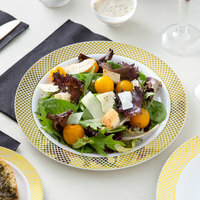 These plates have colored bands around their edges for enhanced visual appeal. Coupe style plates maximize serving space. 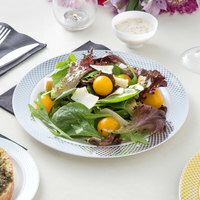 These plates have an etched design for an elegant look. 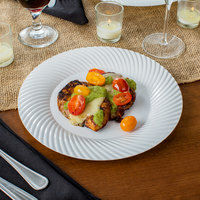 The edges on these attractive plates mimic the texture on scallop shells. 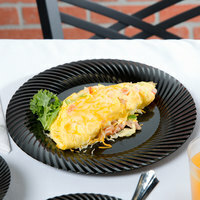 These plastic disposable plates have a contemporary look. Take your food presentation to the next level with plates with wide rims. These disposable plates have a pattern that mimics traditional marble. 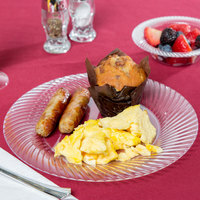 Customizable plastic disposable plates are ideal for caterers and restaurants that want to add their personal logo to their dinnerware. Reduce your impact on the environment by choosing from our selection of eco-friendly plastic disposable plates for your events. 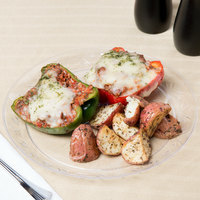 Our selection of disposable plastic plates includes sizes to accommodate any meal, from appetizers and desserts to entrees and sides. You’ll even find compartmented plates that are great for use at buffets, since their multiple sections keep different foods separated. Plus, disposable dessert plates make cleaning up after your catered event or banquet simple, as you can throw these products away when you're done. Complete the look of your tabletop with plastic flatware/utensils, disposable bowls and plastic bowls, and plastic take out deli/catering bowls and lids. If you're wondering where to buy plastic disposable plates, we have a large selection of plastic disposable plates for sale at the lowest prices.